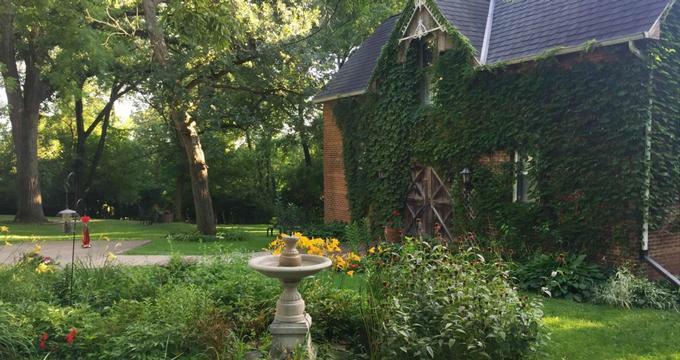 Set in 1882 National Register Home and Carriage House on a private estate in Cedar Rapids, Iowa, the Belmont Hill Victorian Bed & Breakfast is a charming and elegant retreat that offers a tranquil escape from the hustle and bustle of daily life. Surrounded by pristine woodlands and beautiful natural landscapes, the charming inn features three beautifully appointed guest rooms with country-style décor and Victorian furnishings. Boasting beautiful finishes with wood salvaged from vintage Victorian buildings, private bathrooms, and modern-day conveniences, guest rooms provided a warm and welcoming home-away-from-home ambiance. The Belmont Hill Victorian Bed & Breakfast features three beautifully appointed guest rooms with country-style décor and Victorian furnishings. All guest rooms have hardwood floors, king or queen-size pillow-beds dressed in high-quality linens, down comforters, and plush pillows, and en-suite bathrooms with shower/bath combinations, single vanities, fresh towels, and branded bath products. Hypo-allergenic pillows are available upon request. Modern amenities include individual climate control with cooling and heating, flat-screen televisions with cable channels, hairdryers and irons and ironing boards, and complimentary wireless Internet. Named after the original owner and builder of Belmont Hill, the Wolff Room is a spacious ground-floor room furnished with queen-size walnut Amana bed dressed in high-quality linens, down comforters, and plush pillows, and an en-suite bathroom with shower/bath combination, single vanity, fresh towels, and branded bath products. The room also has an antique dresser and romantic loveseat. Located on the ground floor of the mansion, the Heisel Room features a hardwood four poster king size bed dressed in high-quality linens, down comforters, and plush pillows, and an en-suite bathroom with shower/bath combination, single vanity, fresh towels, and branded bath products. The spacious room also has an oak cylinder desk, an oak dresser, and a romantic loveseat. Attractions in the area include the Amana Colonies, the Antique Car Museum, the Brucemore Mansion, the Hoover National Historic Site, the Ushers Ferry Historic Village, Historic Mt. Vernon and Cornell College, the University of Iowa Campus and the Cold Capitol Museum. Also of interest is the Amish Community in Kalona, Amish Community, the Newbo Market/Czech Village Historic District, the National Czech & Slovak Museum, and Library, and the Cedar Rapids Museum of Art.